The Koh Samui long term rental - house Lamai 11 is located in a quiet resort near the famous Grandmother- Grandfather Rock in Lamai, in the North-East of Koh Samui. 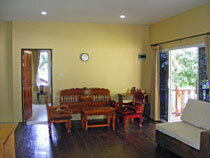 The beach is in walking distance and restaurants, shops and the big Makro market is close by. To Lamai it is just a few minute drive. 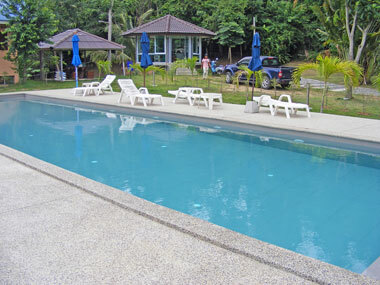 The resort is clean and provides a big communal pool. 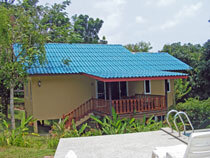 The bungalow is right next to the pool. Escalating a stair in front of the house you reach a spacious, roofed terrace furnished with two wooden benches, a table and two armchairs. 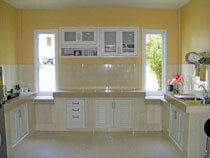 Sliding glass doors give access to the large, open plan living – dining- kitchen area. To the right you find another wooden bench, a table and two armchairs next to a chest of drawers. Turning to the left is a comfortable couch adjoined by the big kitchen area. The kitchen is fully equipped and provides a fridge/freezer combination, a counter, a microwave, a waffle iron, a two burner gas stove, a double bowl sink, pots and pans, floor and wall units. 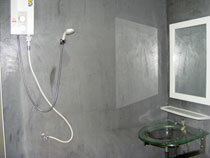 The area is cooled by a pedestal fan. Next to the kitchen is the door to bedroom 1 with a king size bed, a bedside table with a lamp, a fitted wardrobe with a mirror at the side, an air conditioning, and an en suite bathroom with wash basin, shower and toilet. To the right of the door to bedroom 1 you find another bathroom which is accessible form the open plan living – dining - kitchen area and has a wash basin, a shower and a toilet so that your guest do not have to enter the bedroom and this is also the bathroom for bedroom 2 which is at the right end of this floor. 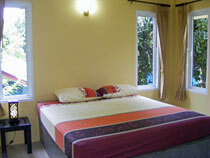 Bedroom 2 is furnished as bedroom 1 but does not have an en suite bathroom. A stair leads down to the lower floor where you find the third bedroom with a king size bed, a fitted wardrobe, and certainly air conditioning. 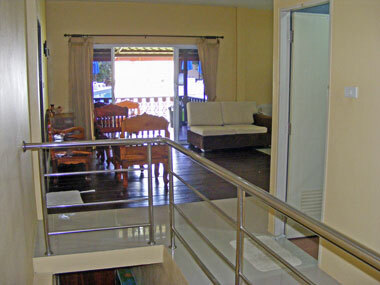 This room has a nice balcony facing the entrance road. 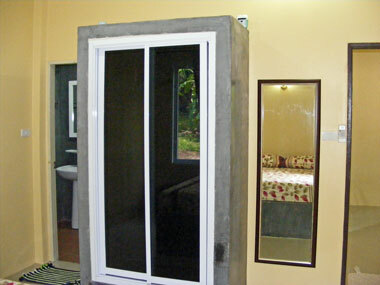 Opposite of the entrance door to the bedroom is a bathroom with shower, wash basin and toilet. 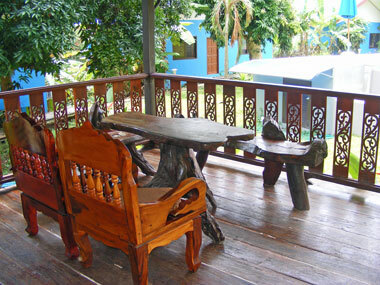 For inquiries, please contact: wolfgang@samuihouserentals.com or use our contact form. Please name the house, Maenam 07, you are asking for, Thank You.